I first met Charlie Liteky in the wake of his most famous renunciation—the decision to return his Congressional Medal of Honor as a way of protesting the US wars in Central America in the 1980s. But this dramatic act of conscience was only one of many challenging and vexing forms of “letting go” in Charlie’s life, as his relentlessly honest memoir Renunciation illustrates. Born in the early 1930s and raised as a strict pre-Vatican II Catholic who went on to become an ordained member of the clergy and a military chaplain in Vietnam immersed in the horrors of combat, Liteky shares in engrossing detail his halting journey of personal metamorphosis—one step forward, three steps back—in which he gradually changed his assumptions about himself, God, the church, other people, and finally his nation. This autobiography could as easily have been titled Restlessness. In this book Liteky confides his almost incessant lifelong pattern of jumping—even escaping—from place to place, from relationship to relationship, and from self-understanding to self-understanding, all in a search for his true home: his ultimate way of being, his ultimate vocation, and his ultimate companion. 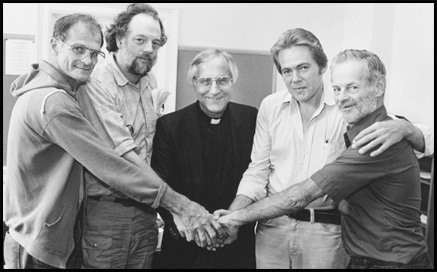 This book illuminates all three: a firm stance against injustice (whether the bullying of his father, the church, a theology of a punitive God or his nation’s ideology of war); a commitment to dramatic nonviolent action; and his life partnership with Judy Liteky that, while not without its struggles and challenges, proved indelibly transformative. A patriot, it took Liteky decades to reflect critically on his experience in Vietnam and the cultural socialization it presupposed. But once he did, a dam of understanding and action burst open. Over the past three decades Liteky has taken upon himself the responsibility to vividly renounce his allegiance to the ways of violence, especially his country’s war-making, by taking action: from prolonged fasting to spending 18 months in prison; from ‘vigiling’ to end torture training to being a stubbornly nonviolent presence in war zones. I have long been thankful for Charlie Liteky’s life, and now that he has shared this account my gratitude has deepened immeasurably. In Renunciation, he shows us the difficulty – but also the beauty and unexpected revelations—of the challenges and potential of the nonviolent life. 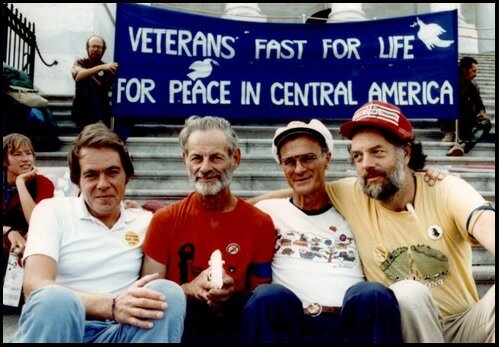 "I met Charlie Liteky on the steps of the Capitol in 1986 when I joined him, Brian Willson, Duncan Murphy and George Mizo for the last thirteen days of their 47-day water-only fast protesting the wrongful US war against Nicaragua. When he and I, both in Vietnam in 1966-67, had yet to recognize that the US war against the Vietnamese was itself wrongful, he earned the Medal of Honor by unexcelled battlefield courage. 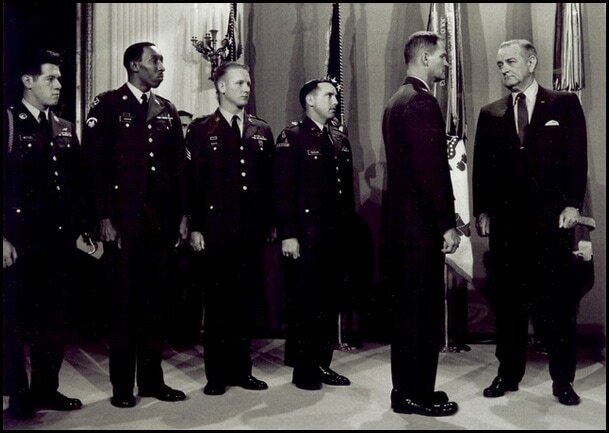 He went on to a life of unexcelled moral courage, in his singular renunciation of the Medal twenty years later and in earning federal prison sentences for protesting the Army’s School of Torturers at Ft. Benning. "In the month of his death, Charlie Liteky leaves us a book that has never in our lifetimes been more urgently needed in America, to inspire courageous, conscientious resistance to both ongoing and newly wrongful policies. What a story! What a parting gift he leaves us!" --Daniel Ellsberg is a former U.S. Marine company commander and defense analyst who released The Pentagon Papers. "In these challenging times, people are searching for inspiration and hope. Charlie Liteky’s transformation—from wounded warrior in Vietnam to internationally known war resister—has touched the lives of many in deep and profound ways. 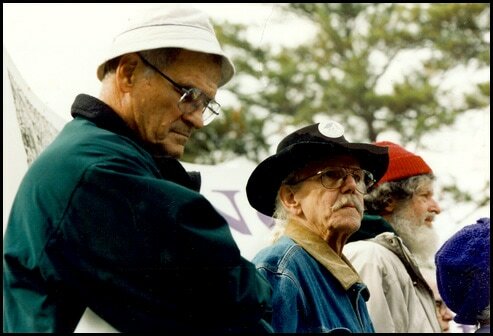 Meeting Charlie and his wife, Judy, years ago, was a gift. I highly recommend this book to all people who struggle for peace and justice." --Roy Bourgeois is a Catholic priest and former U.S. Naval officer who received the Purple Heart in Vietnam. He is the founder of School of the Americas Watch. "Charlie Liteky is one of a kind. Renouncing his Congressional Medal of Honor in protest of US policies, for three decades he consistently and tenaciously expressed his conscience condemning egregious US polices, at home and abroad, inspiring countless people to escalate their own actions of dissent in a country gone stark raving mad." --Brian Willson is a former U.S. Air Force officer and Vietnam veteran who has long resisted U.S. military policy. Author of Blood on the Tracks. "An undisputed hero who, while under fire, saved the lives of numerous wounded military personnel in Vietnam, Chaplain Charles Liteky received the Medal of Honor bestowed by President Lyndon Johnson on November 19, 1968. But he grew to see the shadows on his government’s policy and conscience directed him to renounce this highest military honor. "Chaplain Liteky left the Catholic clergy in 1975. In 1983 he married Judy Balch, a former nun. On July 29, 1986 Charles Liteky placed his medal in an envelope addressed to President Ronald Reagan and left it at the Vietnam memorial on the National Mall in Washington, D.C.
"As soon as we at the Office of the Americas heard about his witness we honored him with a West Coast reception. 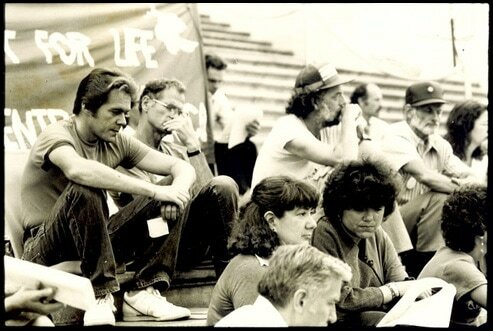 We continued a cherished friendship and in September of 1986 my wife Theresa and her assistant went to Washington, DC to assist Charlie and his colleagues in publicizing THE VETERANS FAST FOR LIFE, protesting United States intervention in Central America. In the wake of peace accords in Central America, Charlie was jarred by the Elder President Bush and his January massacre of Baghdad in 1991 (including 88,000 tons of bombs on the civilian population). The sin of aggressive war which has marked our nation’s behavior since the end of World War II. This sin also represents the gravest violation of international law. The sin of American Exceptionalism, which has been made into a civic religion to sanctify our aggression. Various names were used to justify our assault on the indigenous people in America together with over one hundred interventions in Latin America. Such aggression was sanctified by the phrase Manifest Destiny in the 19th century. The sin of chaplains, military personnel, and civilian theologians claiming that we have been engaged in “just wars.” He renounces this falsehood. The misuse of just war theory has recently been denounced by theologians at the Vatican and represents a long subservience of the Church to the state since the time of the Nicene Council. We need him, his courage and his message to face the clear and present danger to the human race." 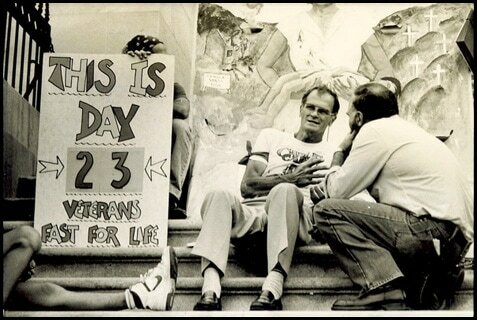 "I met Charlie at the Veterans Fast for Life in 1986. His living witness and vow to place the lives of others before his own changed my life. In these uncertain times, Charlie's memoir Renunciation, inspires and challenges readers to recommit themselves to the journey for a just peace." "This is Charlie's story, really 'his-story', made available for present and future generations. It proclaims vividly Charlie's honoring the universal mandate to live and to act for the common good. The Liteky brothers (Charlie and Pat) acted in accordance with common sense, with which each of us is endowed, but to which, at times, we may not always be listening. Read this book!" --Megan Rice is a former missionary in Africa who has been arrested almost 40 times in her quest to rid the world of nuclear weapons. "Charlie Liteky did not have this double standard practiced by our government. He believed, as does Brian Willson, that 'Our lives are not worth more and their lives are not worth less.' Charlie was willing to risk his own life and well being to try to save human lives—whether in Vietnam, Latin America, Iraq, or any other part of the world. He found the courage and determination to act on this belief over and over again. "Charlie’s book, Renunciation, is a powerful story of his journey from American patriot believing in the 'good war' to a man who came to see the whole human family as part of his own family and was willing to put his own life on the line to act on that belief and save others in his family from torture, death and destruction. "Charlie has been and will continue to be a mentor and role model for all of us who want to live in a world free of endless war and killing of one another. Together with Martin Luther King, Jr., Charlie lived his life to help build the 'beloved community.' Read Renunciation and feel inspired and hopeful that each of us can make a difference." "Charlie Liteky's heroism in Vietnam is legendary. His courage while saving the lives of numerous comrades is almost beyond belief, and he was awarded the Congressional Medal of Honor for it. But I'm even more impressed by Charlie's moral heroism—although he would never call it that. This book recounts, in his own words, the process by which Charlie became a conscious, nonviolent warrior for peace." --Margaret Knapke was prosecuted with Charlie Liteky and seven others in 2000 for "crossing the line" at Ft. Benning, GA.
"Bart Giamatti, once the president of Yale, later commissioner of baseball, reportedly said of Ted Williams: 'He was the kind of guy who, if he'd been born a chemist would have had to win the Nobel Prize.' Those of us who were privileged to know Charlie Liteky in religious life had similar feelings: the kind of guy who, if chance and God somehow saw to it that he ended up in a foxhole in Vietnam with a cross on his helmet, then nothing would do except for him to win the Congressional Medal of Honor. Not that he was lusting toward fame, or even heroism. Just something in his make up to do what seemed practically impossible, defying human capability. Well, he did it. "The French have an expression: notre demon est le mesure de notre ange. 'Our demon is the measure of our angel.' This, too, I think is a truth about Charlie Liteky. Great dark passions always stirred, but without them he couldn't have been fueled to the greatness he achieved. He was never a man without fierce pride. He was stubborn. But there was a childlike gentleness there that could also be perceived, a certain whimsy, a naïveté, and a wonderful ability to cackle. And the man's hands, oh, those hands that could swallow your own hand, and, if you had a football nearby and ‘lateraled’ it his way, were then capable of tossing the damn thing seventy-five yards downfield. "That legend lived large in our seminary world, a world that seems now back beyond the moon, lost to time. But certain figures bump up large in that myth, and Charlie Liteky—or Brother Angelo, as was his professed name in the seminary—was chief among them. Sail on, sailor." "As we prepared for the 1997 SOAW sign action at Ft. Benning, I watched Charlie repeatedly unpack and repack his small pickup truck. I teased him about it at the time but have retained that memory. Just as Charlie thoughtfully and carefully rearranged his physical possessions, he also thoughtfully and carefully reassessed his spiritual and social connections and obligations. As he learned more he accepted more; as he accepted more he challenged more. 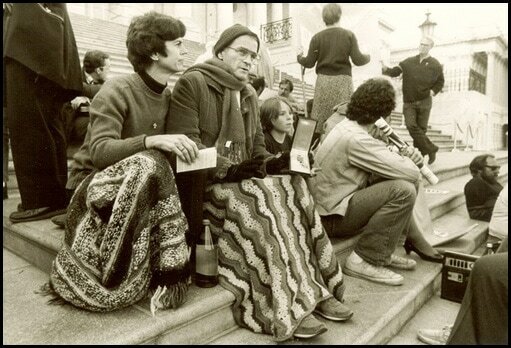 Charlie was always on a journey and this memoir allows all of us to travel with him." "Charlie Liteky is in the vanguard of the upcoming GREAT AWAKENING of the people of the United States. With the coming of the Trump administration, people are organized as never before. The future of life on this planet is at stake. We will not tolerate perpetual war. And war is the very greatest threat to the environment. Read Charlie’s book. He is a prophet of Church and State."